Leave a comment on THIS post by 6 p.m. CT Tuesday, September 6, 2016 to be entered in the DRAWING for a copy of the book below. If you mention in your comment that you’re a follower (see in the left sidebar “Join This Site” and “Follow by Email”), I'll add your name a second time in the drawing. U.S. mailing address required to receive a paper book. I may or may not have read books offered for giveaways. The mention and giveaway of books on my blog does not in any way indicate any manner of my endorsement of said books. Read book giveaway details at Disclaimers. To provide you security, please leave your email address like this: johnATyahooDOTcom. Winner announced in next Thursday's blog post. the good, the bad, and—maybe one day—the chocolate. She’s the author of Entrusted: Surrendering the Present, as well as the sequel, Entangled: Surrendering the Past. She also shared her story in the infertility devotional, A Walk in the Valley. She blogs every other Wednesday for Christians Read. She resides in Ohio with her husband and two children. Learn more by visiting her at her website. Welcome, Julie! If you could have dinner with one person from today or history (except Jesus) who would it be? Why? I think I would enjoy a dinner with President George W. Bush. I think his faith story is a fascinating one, and although he might not have been a perfect president, I believe he was a compassionate one. He seems like a person that would be interesting to chat with over a thick steak. I was born on Good Friday with tornado warnings. I used to live 7 miles from the Watkins Glen NASCAR track. I can usually guess what year songs and movies from the 1980s were from and be right, but I have the hardest time getting Bible verses completely accurate. I’m one-third done with Engaged: Surrendering the Future, the last book in the Surrendering Time series. Trish Maxwell was the bad girl in Entrusted, and now she’s back in Speculator Falls with no job and a lot of explaining to do. Everyone wants to know what her next step is. Will it include the handsome paramedic who caught her eye? Reviews are vital. If you enjoyed Entangled or Entrusted, leave a review on Amazon and Goodreads. Tell others. Word of mouth is such an effective means of marketing, and I can’t do it without help from the readers. I appreciate every single thing readers do to let others know my work exists and that it is worth reading. Please tell us a little about your novel, Entangled. 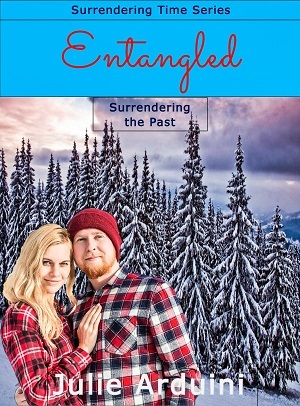 Where can readers purchase Entangled? Thank you, Jo, for having me today. I really appreciate it! 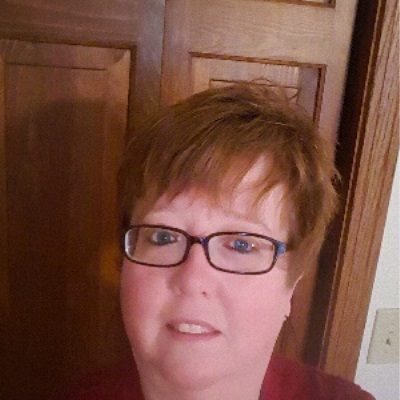 Julie, thanks for visiting with my readers and me. One commenter to this blog post will be selected to receive an eBook copy of Entangled that Julie has offered. Commenters please leave a comment before 6 pm CT September 6, 2016 and remember to leave your email address so I can contact you if you’re the winner. The winner of last Thursday’s blog post for a copy of Mail Order Surprise by Lucy Thompson is Nancy. I’ll email you. Thanks all for commenting. 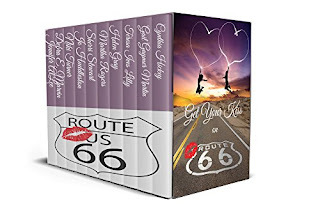 Watch for more book giveaways. Julie, you most welcome. Having you visit is my pleasure. Enjoyed the interview. Would love to win a copy of the book. Ann, glad you enjoyed the interview with Julie. Thanks for commenting. I would like to see the surrender of pride. Thank you for a great interview. Deana, you're welcome. Thanks for leaving your comment. Sonja, you're welcome. Thanks for following my blog and for commenting! Carla, thanks for stopping by and leaving your comment. I love Julie's writing! Glad to learn more about her life. Carolyn, thanks for coming by and leaving your comment. Carolyn, I NEED YOUR EMAIL ADDRESS TO ENTER YOU IN THE BOOK DRAWING SO IF YOU WIN I CAN CONTACT YOU. Janet, you're welcome. Thanks for commenting. Surrendering grudges! Thanks for having the giveaway. I'm a follower. Rose, you're welcome. I appreciate you following my blog and also for commenting! I love Julie's Surrender series. She is a terrific author. And it was nice getting to know a little more about her. Thank you, Julie, great interview. Marie, glad you enjoyed the interview with Julie. Thanks for commenting. I NEED YOUR EMAIL ADDRESS TO ENTER YOU IN THE BOOK DRAWING SO I CAN CONTACT YOU IF YOU WIN. I would like to see the surrender of stress. rubynreba, thanks for following my blog and for coming by to leave your comment!